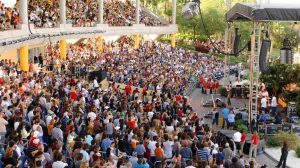 Bands, Brew and BBQ is Back at SeaWorld! Central Florida’s favorite BBQ festival is back for four sizzling weekends in March with a special salute to America’s Heroes, and special discounts and offers for all enlisted men and women and retirees from the military. Bands, Brew and BBQ will take place on the weekends of March 7-8, 14-15, 21-22 and 28-29, and will feature live concerts from top classic rock and country bands and artists, the tastiest BBQ from Central Florida’s top local smokehouses, plus SeaWorld’s own Sweet & Smokin’ Barbecue. Proceeds from this event benefit the USO, an organization that has been lifting the spirits of America’s troops and their families over 70 years. Stay tuned for the latest information regarding the festival and music lineups! Are you heading to Bands, Brew and BBQ this year? Let us know in the comments!